Thanks for everyone's vote of confidence that I could complete an impromptu marathon with just 2 months of training. Sounds like around 3:10 was a popular prediction. The 1st bar shows my monthly mileage for Joong-an marathon in Nov 08. The prep was quite similar to current situation. We were in Japan for holiday and rarely ran for 2 weeks. Then I embarked on 8 weeks of marathon training. Av mileage for that 8 weeks block was 384k per month. If we include another month before that (including holiday period), the 3 month average was 355k. This yielded 3:11 marathon. The 5th bar shows the projected mileage leading to Seoul 2010 (mid Dec-mid Mar period).This assumes 90k average for Week 3-6 and 70k average for week 7-8. This produces a monthly average of 330 for 3 months and 360 for last 2 months prior to the race. - Based on Joong-an and GCM data, it seems higher mileage & longer prep correlate positively with marathon times (at least for me). There is pretty strong evidence that 3 months averaging 400k+ helped me to attain faster marathon timing in GC. - My mileage are concentrated in the last few weeks before the race as depicted by more mileage done in last 2 months versus last 3 months. - To say that my mileage is higher than Higdon's advance plan is misleading, since Higdon's plan runs for 4 months. My training plan is only 2 months. So, that's a bit of analysis based on mileage. It's more difficult to compare intensities since all the workouts in each cycle are different. If we use average weekly training pace as a proxy for intensity, presently the data show that I am still averaging a the same training pace. In fact, my average pace still hovers about 5:00 pace and it hasn’t changed in four years! Another 'ramping-up' week, with midweek and weekend long runs being extended to 20k and 32k respectively. Paces for these two runs are still on the slow side as my body is still adjusting to 100k weeks. Had one good threshold workout, but a dud again when doing hills. Next week will be another 'ramping-up' week with long run further stretched to 3 hours. Another good week well done, good effort re the long run. Interesting re the comparisons, I do a similar thing but base mine on the last 10 weeks of training and also include average pace to give me a feel for things. Been very accurate as a predictor except for Perth 2009 when I hurt my adductor/groin. Consistent high mileage is probably a safe way to go for a PB. Too late for that, so do what you can, and run a 'sensible' pace on the day. Have you tried the Higdon Advanced 11 plan? That's the one I'm thinking of following. There have been some good endorsements of it (but I guess all plans have those). I like the idea of lower mileage and easier paced long run. 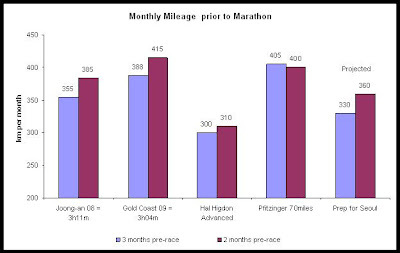 Ive also compared my Melbourne Marathon buildups over the last 3 years. Ewen, I haven't tried Higdon marathon plan.